The horses listed below have now found permanent loving new homes. Apollo is a sweet boy with trust issues after having been neglected and abused. He has not been broken to saddle. His carer has been working to regain his trust and he is making good progress. Apollo has been in care since January 2018. 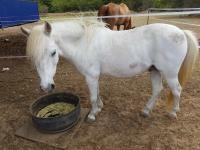 Beau is a spritely pony, with a happy, mischievous outlook on life. He is lovely to ride, very athletic and quick on his feet. Would be a lovely second or third older child’s pony – requires an experienced rider and firm handling as can be a bit naughty on the ground. Good to saddle, trim, rug, groom but can be a bit naughty when paste worming and with dentistry. Has been ridden by small adults in the past with no issues but is now going to waste in the paddock. He is a gorgeous, cheeky little pony, that needs a patient, experienced owner to remind him that he has to behave appropriately even when he doesn’t want to! 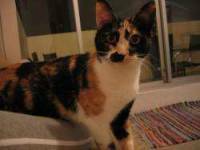 Mia has a lovely temperament and is very friendly. Mia loves being with people and will follow you around the paddock. 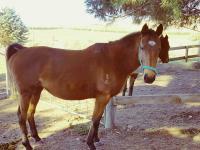 Mia will make a lovely ridden horse in an experienced home where she will be educated or sent to the trainers. Alternatively she would be a great companion horse, Mia is not dominant in a paddock or with other horses. 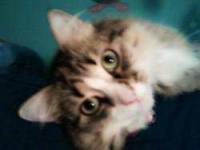 Poor Mia was neglected by her previous owners. She was extremely skinny and had a large flesh wound on a hind leg from going through a fence. The injury has healed completely but has left some surface scarring. According to the vet it will not cause soundness issues. 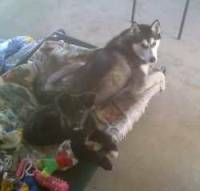 Mia is located in the Goulburn area. If you're interested in giving Mia a good home where she can be assured of a secure & happy future, please email Kristy for more information. Kirby is a predictable and even tempered, well mannered pony. He's good to groom, trim, lead & handle. Kirby's background is largely unknown, however he's been a riding pony in the past and has had a basic to intermediate level of education. He lunges fine, he's a bit unsure but not silly in any way. We have test ridden him several times and he is easy to saddle up, obedient at a walk and trot and good in new surroundings, however he's not being ridden regularly. Under experienced supervision Kirby would suit being a lead rein pony for a young child, or an independent pleasure riding pony for an older child. Kirby has been neglected before coming to us and has some white hair along his back that may be due to untreated rain scald, however he is also a Roan Bay, so this may have always been part of his colouring. If you can give Kirby the great forever home that he deserves, please contact us for more information about him. * Last photo taken in early April 2015. Tilda is a very sweet old girl and loves attention. Without fail she is always the first to the gate when you arrive for feed time, and loves nothing more than some carrots and a good neck scratch. She is good to handle, easy to catch and trim and travels well. She gets on well with other horses in a paddock situation. Very little is known about her background. Tilda (Gain Time) was retired from racing in 2002. When the current owner acquired her she was suffering from serious neglect and possible abuse. She had to be brought back to health before any riding was considered. Since then Tilda has been saddled and lunged but not ridden. 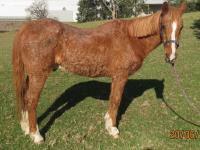 She is being sold as a companion horse at this stage, but in a knowledgeable home may be rideable with training. Tilda is regularly wormed and trimmed. She is up to date with her vaccinations. Located in the Hills District. Katy is very kind natured, gentle and friendly. She's easy to handle and good to float and rug. Katy is still very lively and canters up for her dinner, she's a pleasure to handle and patient with children. Katy needs hard feeding once or twice daily depending on the season, and a farrier trim every 6 weeks. She is suited to a knowledgeable home as a companion horse, or could possibly give lead rides to children. If you could give this lovely old girl a nice retirement, or a foster home until a permanent home is found, please contact us. She is currently located in the Port Macquarie area. Topaz is a sweet old boy in need of a retirement home. His owner is very upset at having to part with him, but it's become necessary due to a change in circumstances beyond her control. 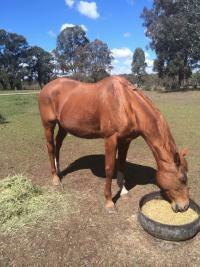 He was a dressage horse is his younger days, and has had the best of care throughout his life. He needs to be hard fed twice a day, rugged on cold, windy days (he comes with his rugs), and have access to a shelter or stable. Being kept at home is ideal. 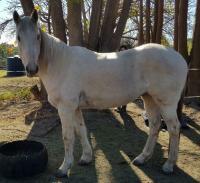 His vision is blurry due to cataracts and he has arthritis in his back legs, so he needs a paddock with safe, visible fencing and another calm horse for companionship. If you can provide a permanent home for Topaz where he can live out the rest of his days in safety and comfort, please contact us. 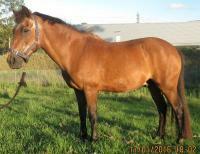 Australian Saddle Pony Gelding 14hh, 7yrs. Remmy is a beautiful horse with a lovely, kind nature. He's double registered with the Australian Saddle Pony Association and the Riding Pony Stud Book Society. He's good to trim, rug, handle and he floats well. Remmy was broken in as a four year old and started liberty and ridden training where he proved happy to be ridden alone, in a group, or out in the paddock with other horses. He's recently had a break from riding and needs an experienced person to bring him back into work and continue his education. 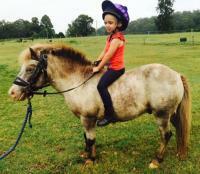 Remmy will make a lovely pony for a small adult, teen, or a second pony for a capable child rider. 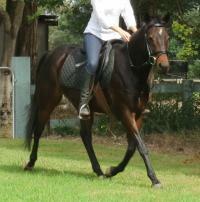 Ronaldo is a lovely horse with good conformation and an easy going, even temperament. He's a good doer and maintains condition easily. He hasn't been ridden for several years so is suited to an experienced rider only. After re-starting or sending him to a trainer he would enjoy long rides, rounding up sheep or cattle, or would make a lovely dressage horse. Ronaldo needs an experienced rider but is tractable, easy to train and responds well to the principles of natural horsemanship. With the right guidance, Ronaldo is a horse you could derive a lot of pleasure from owning and riding. Moonshine was adopted from DCH at Christmas time and with the help of my 4yr old daughter he is now broken to saddle and happy, although green, as a lead rein pony. Sadly, she would like to do competitions and shows and due to Moonshines past he is not quite up to that level yet. 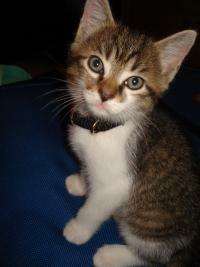 He needs a kind and knowledgeable home as he can worry around strange people. Moonshine is good with the farrier and loading on the float. He does not bite or buck, has no major health issues and is up to date with dentist, vaccinations & the farrier.